Despite leading for nearly half the game, the University of San Diego men’s basketball team couldn’t close the deal against No. 6 Gonzaga in front of a sold-out crowd at Jenny Craig Pavillion on Thursday night. Before the second time this season, the Toreros (17-12, 8-9 West Coast Conference) gave the Bulldog a scare. Gonzaga (26-4, 16-1 WCC) started off with an early lead before USD fought back to take the lead for nearly 20 minutes before the Bulldogs pulled away with a 77-72 win. Five Bulldogs finished in double-figures scoring, including Killian Tillie, who lead the Zags with 17 points. Rui Hachimura scored 16 points, Johnathan Williams had 11, and Josh Perkins and Corey Kispert each scored 10 points apiece. USD went to the locker room at halftime with a 3-point lead, 37-34, and extended its lead to eight at the start of the second half at 44-36. A 3-point jumper by Isaiah Wright made it a 51-44 lead but the Bulldogs answered back with an 8-0 run for a 52-51 lead. A jumper by Olin Carter III gave the Toreros the lead back and USD would hold on to the lead until a three-point play by Zach Norvell Jr. to give the Zags a 57-56 lead. Hachimura scored 10 of his 17 points down the 4:14 stretch at the end of the game. 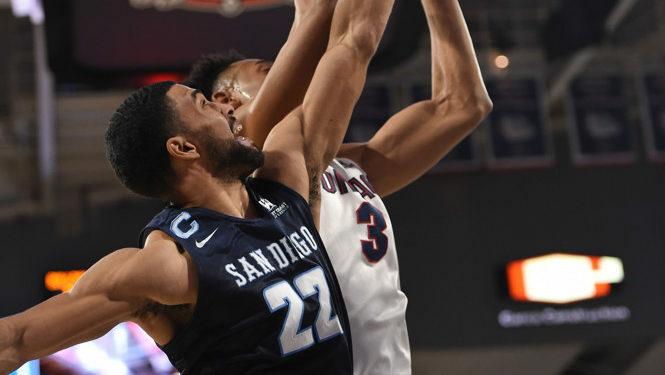 Carter III scored two treys in the final 30 seconds to keep USD in the game but Gonzaga made all of their seven attempts from the free-throw line to hold off the Toreros. Carter III scored a game-high 21 points, followed by Wright and Pineiro with 14 points each and freshman Yauhen Massalski contributed 11 points. With the win, Gonzaga now has at least a share of the WCC title. USD will face the San Francisco Dons for its final regular-season game Saturday.